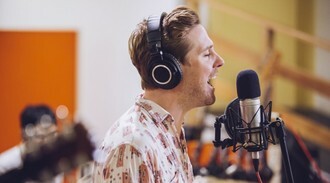 Ricky Wilson’s life is pretty busy these days: he’s the lead singer of the Kaiser Chiefs, a coach on The Voice – and now he can add “radio presenter” to his CV. The 37-year-old has signed up to DJ on XFM and will likely host a weekend radio show on the station. XFM is currently on a hiring spree, according to The Sun – former Radio 1 Saturday show host Vernon Kay is due to join, and a deal with radio DJ Chris Moyles is reportedly in the works. Ricky will have to split his time between his new job and and filming the latest series of The Voice, where he’ll be working with new judges Boy George and Paloma Faith, as well as long-standing judge Will.i.am. A source told the newspaper: “It’s been something that Ricky has been discussing with his team and XFM for some time.